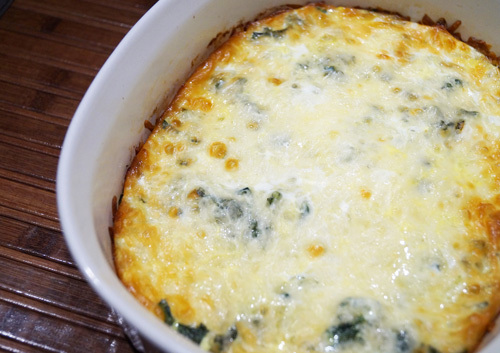 If you are looking for a low-carb, well-seasoned, and savory meal this tasty, filling, and nutritious egg bake is the perfect choice. It is flavorful, delicious, and quick to make and combines veggies and healthy sources of protein. I use this recipe at least once a week because of the balanced and healthy mix of ingredients. It is also a great dish to prepare during a busy and hectic workweek. As you can see, the recipe doesn't involve complicated steps, which makes it a tasty and easy-fixing meal for your whole family. Preheat oven to 180 C (350 F). Heat olive oil in a pan and add the onion. Optionally, you can add 3/4 teaspoon of ground nutmeg. Cook for 2 - 3 minutes and add the kale. Stir for about 1 - 2 minutes. If you use baby kale, cook for 1 minute. Beat the eggs. Spray oil in a casserole and transfer the onion and kale mix. Spread Mozzarella on top, add the eggs, and mix well. Bake until lightly brown or for about 35 - 40 minutes. Let aside for 5 - 10 minutes. Serve with a side dish or sour cream. You can use grated Gruyere cheese instead of mozzarella and 10 ounces of spinach instead of kale. If you use frozen spinach, thaw, chop, and dry.